Welcome to part 2 of the Shark Costume Tutorial series! 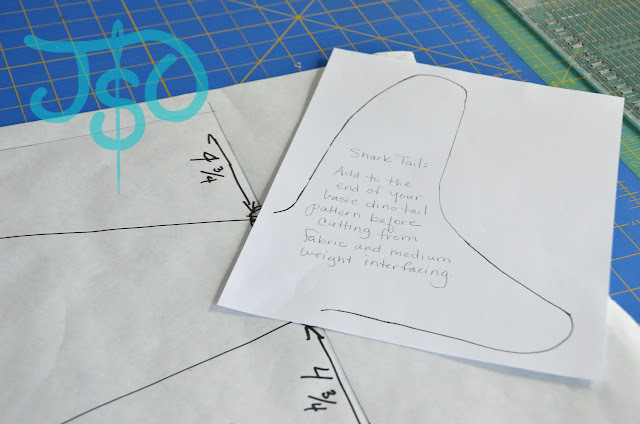 This posting will focus on drafting and cutting out the tail. I love making Halloween costumes. 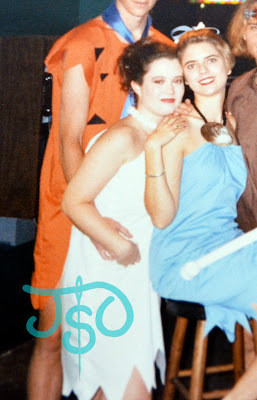 In fact, Halloween costumes were the first project to really make me want to learn to sew. I just HAD to have something different from the standard brothel pirate costumes and Elvira wigs at local stores, but I didn't exactly have the funding for anything elaborate. Did I mention I had no idea how to sew? I went to the local Joann's and browsed the Halloween patterns, trying to find something I could manage on my own. Eureka! The Flintstones! How hard could it possibly be? Didn't the costumes turn out cute?! Sorry for the quality...and cropping. 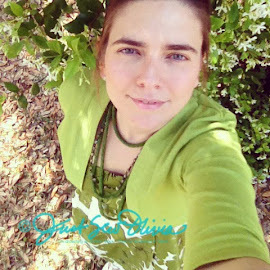 No creepy ex-boyfriends on this blog! First, I sketched out the tail on the matte side of freezer paper. 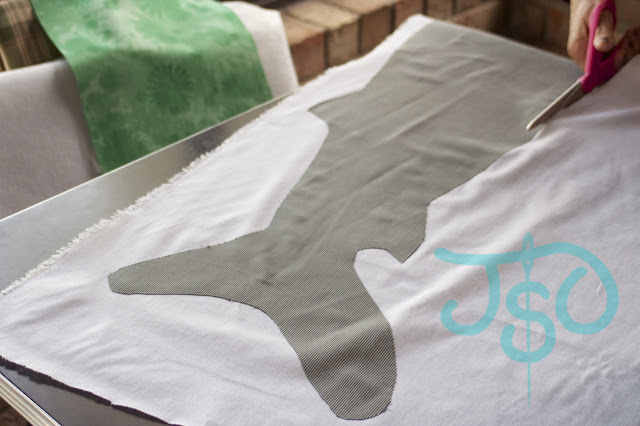 Freezer paper is officially the most useful stuff EVER, right behind vinegar. It's perfect for pattern pieces, because you have a matte side that's easy to write on, but then you have a shiny side that irons on to fabric and then easily peels off without doing any damage. 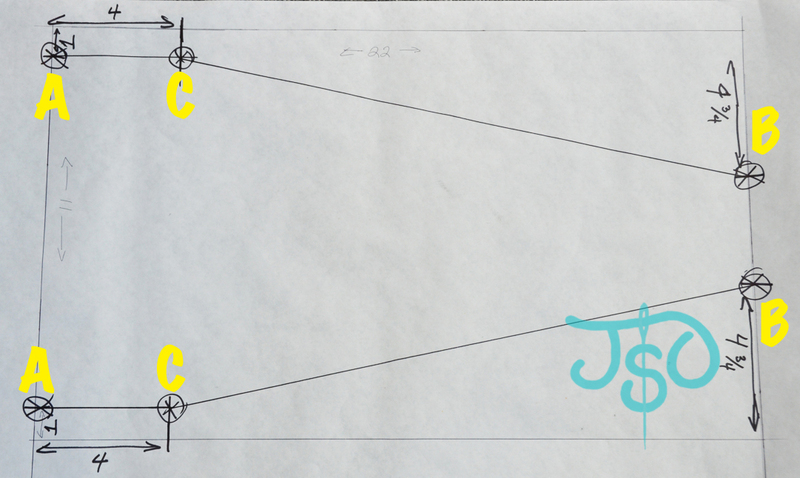 To start sketching, measure and draw a rectangle on the freezer paper 22 inches x 11 inches. 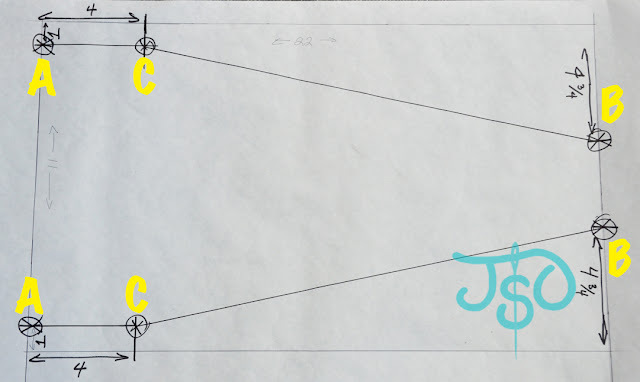 On the left boundary line of your rectangle, make a mark 1 inch from the top and bottom of the box. See points labeled A below. On the right boundary line, make a mark 4 3/4 inches from the top and bottom of the box. See points labeled B below. On the top and bottom boundary lines, make a mark 4 inches from the left boundary and extend the mark at least an inch towards the interior of the box. 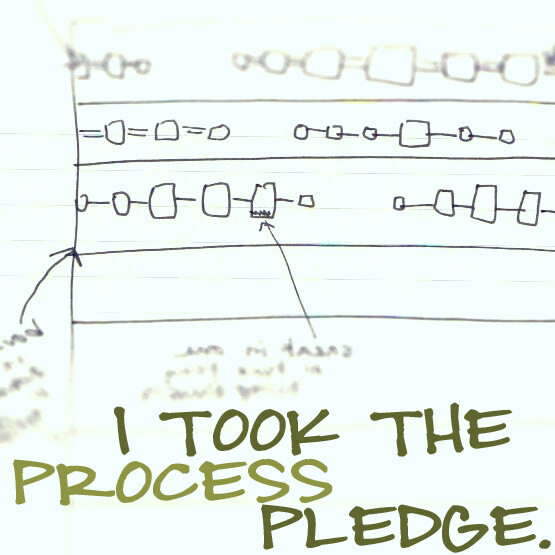 Draw a line from point A to this line. The intersection is point C.
The opening left between the B points on the right side should fit your shark tail pattern almost perfectly. 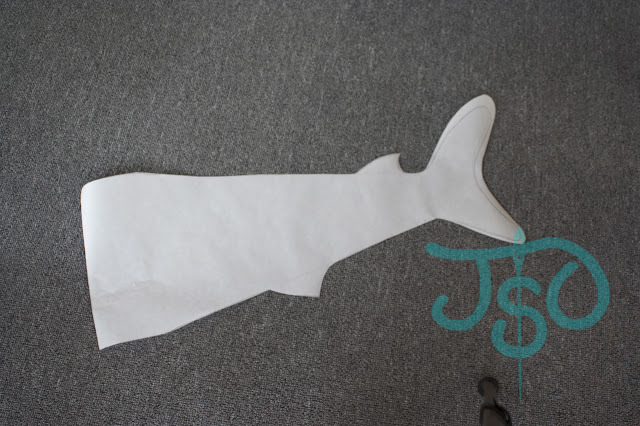 Cut out your shark tail pattern and glue or tape it in place to your drafted tail. Freehand in a couple of mini-fins top and bottom. Ta-da! Don't mind those extra marks. 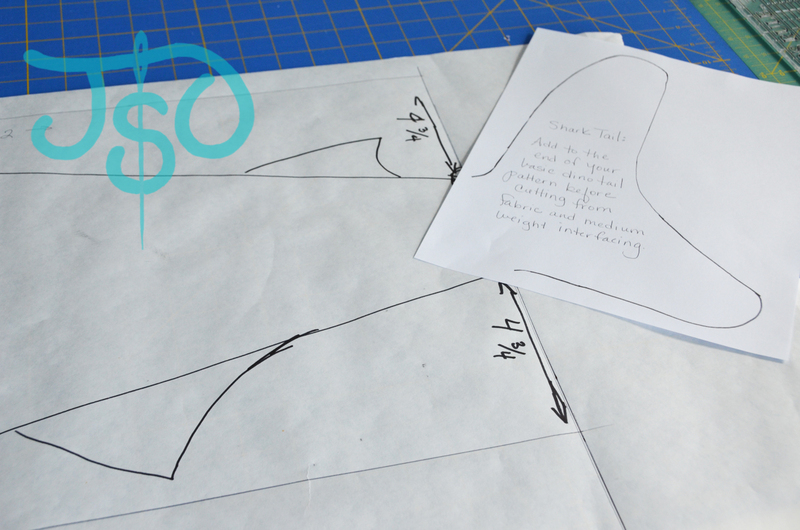 This is my original pattern piece, which was marked up and then adjusted to include seam allowances. Next, from the same fabric, cut 4 rectangles sized 3 inches by 12 inches. 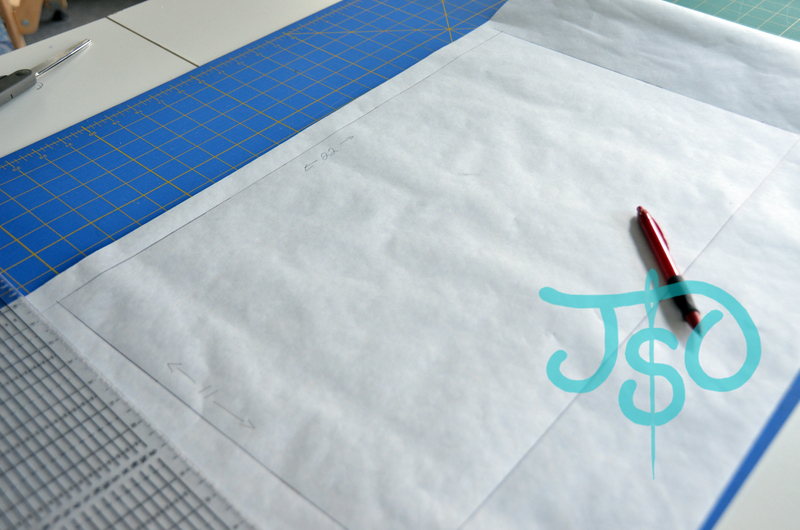 Repeat this step, cutting from lightweight fusible interfacing. These will make up the waist straps. Finally, cut out 1 booty circle 7 inches in diameter from the pattern I provided. Repeat this step, cutting from your remnant of heavy duty fusible interfacing.